I apologize if this is addressed elsewhere, haven't found a clear answer: I'm trying to save money in the long run by doing my own stringing. But it would be *very* long run if I forked out a ton of cash for an expensive machine. Anyone have experience with the cheap machines around $300? Do they get the job done? The one thing to consider is your time and what that is worth. If you have no other pressing priorities in your life and have the time to take to string on a flying clamp drop weight machine, then go for it. They are more than service-able. If you have other factors in your life that make your time more precious. I might consider pushing your budget higher as things like fixed clamps, a lock-out/crank, or electronic constant pull will make the job easier and quicker once you get the hang of the process. I just upgraded to a fixed clamp drop weight machine from a drop weight with flying clamps. For me, I wanted something that would be a bit quicker, as I was finiding it hard to carve out the time to string. At least with this new machine, if I am still too slow, I can invest in an electric pull unit to add and have a really nice set up. Thanks y'all. This is helpful. I use three or four rackets and only restring every 2-3 months or so. So it doesn't sound like it would be too time consuming to go with an entry level machine. Now ... how the hell do I string a racket? Try to get a machine with fixed clamps. I have a Klippermate (drop weight, flying clamp, $180 retail) that I've been using for 10 years now. Takes me about an hour to string one of my racquets but I know the string pattern by heart so it doesn't really take any thinking. Another benefit (besides or because of the reduced cost) is that it lets me try different strings and tensions more easily. It took me many iteration to find my current setup. Who knows, you might end up enjoying stringing. My wife said it seems like it helps me relieve stress the way people knit sweaters, and I also like the mad scientist aspect of stringing up weird hybrids and taking them out to see if they're any good. Yes, you can save money, but as this post shows, you can also spend more than you are currently because of the temptation to try different types of strings/tensions. But, you'll probably eventually get over that. I've mostly gotten over that. If you only string once every 2 or 3 months then it is always going to be time consuming to string (lack of practice) and even more so with an entry level machine. Has casters so I can roll it around, and the casters lock so it won't run away while I'm stringing. Also will hold other stringing stuff (clamps, string sets, pliers, etc) while both in use and in storage. Its one of the best investments. Buy a drop weight machine and it will serve your needs for a long time. Can't go wrong with either those options, choose one based on their features and offerings. I would recommend the Gamma. They are the most entry level and less than 250.00. Search no further. Also stringing is easy, it seems complicated but once you do 2-3 times, its easy. Things you need to look up are how to start your mains, which grommets to skip which you can find out by looking at your racquet model and they tell you which grommets to skip for crosses (strings that go across), how to tie off knots, how to make starting cross knot, and how to tie off the cross knot. Don't be intimidated its actually very simple if you are even slightly handy you will pick it up. Stringing videos and what you need to know are covered in the first 2 threads at the top of this forum. It is not that hard to learn how to do it. Unless you have 10 thumbs. If you lean on the KISS principles, you will have no issues. Instructions on how to string frames can be found at the manufacturers' web sites, The KlipperMate website, or by inspection if you are experienced. You need to know what holes have to be skipped for crosses and what holes should be used for tie offs. I am partial to the KM starter machine because everything is metal. Placing mains in your frames is easy. Placing crosses take a lot longer because you have to weave the string thru the mains. After a dozen frames, it will become easier. If you are only stringing once every 2-3 months, then just find a decent person to string it. If you are going to do more, you should get a machine with a study table and fixed clamps at minimum in my opinion . 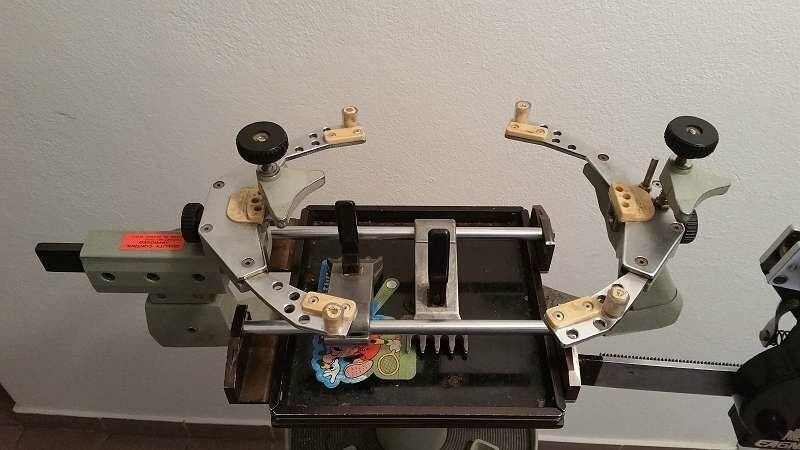 I started stringing in 1968 with a automatic drop weight, fixed clamp machine. If I started with a machine like an X-2 I probably would have given it up. The more features, the easier and faster and more enjoyable the process is. Go cheap and there is your time and effort you end up paying with. A fixed clamp machine has less draw back, and easier to get more consistent results. I'm trying to save money in the long run by doing my own stringing. That comment is so naive it it is funny. Don't mind me but I bought my first and only stringing machine so I could more cheaply experiment with strings. That notion has caused me to buy more of the same rackets so I can experiment several strings against the others. It is madness For instance, I have 9 rackets of a particular type just so I can challenge one string against many. I would be embarrassed to show you my box of string, all for myself. I hear you. But in the end, it's up to you how far you want to take it. In my case, buying a stringing machine first allowed me to experiment with a few strings, then with different tensions. Eventually I got to a setup that I liked, and I've been sticking with it for a while now. At this point, it's a matter of both convenience and saving money. If I want a fresh racquet for tomorrow, I can easily string it myself, without depending on anyone else's schedule. how the hell do I string a racket? Nothing to it but first you need a stringing machine. The machine you have dictates how to use it. Try to find a used Klippermate or Gamma X2 on an auction site. Ask the seller to show you how to string one of your rackets. Watch a few YouTube videos (it may help to play the videos on high speed all you need is the high level process.) Ask questions here as you encounter problems. EDIT: If you know someone that strings (you probably do ask around) ask them to help you. Or you could take a lesson from a qualified USRSA Instructor. Go to a stringing shop and watch. Where do you live? you might even find someone on here willing to show you how to string. Otherwise there are lots of good videos on youtube, but beware there are also lots of not so good. There is a sticky post at the top of this forum, that would be a good place to start. Anyone have experience with the cheap machines around $300? Buy a better, used machine. Yes. Fixed clamps and 6 mounting points. Solution: Play more tennis, break or cut more strings, restring often. Results: Practice stringing and stop playing with dead polys. No. I just mount my stringer on top of my kitchen table. I would only get a stand if you have room to keep the machine mounted on it. The clear answer imho: Find a used fixed clamps with 6 mounting points. Job done. If you do enjoy it, youll get faster at it..
A fixed clamp, 6 points dropweight can be had for well less than $200 and will be more accurate and easier to learn on than a cheap $200, 2 points with flying clamps. I could be wrong. 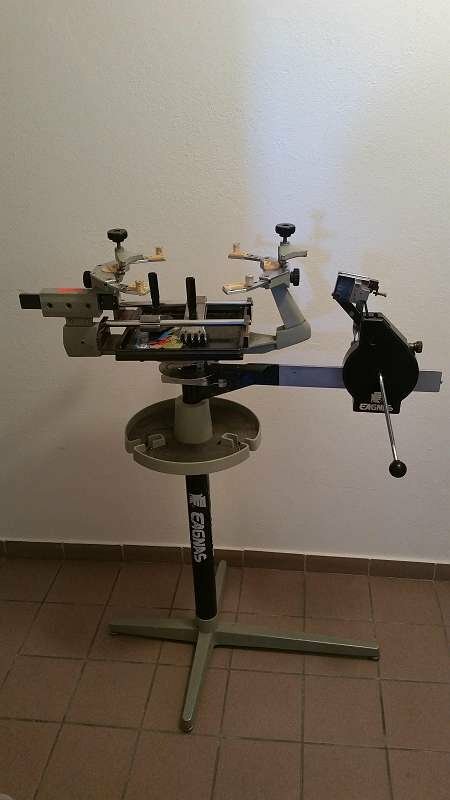 You can also sell the second hand machine for pretty much the same amount that you bought it in case stringing isn't for you, so I just can't see the advantage of buying an inferior new stringer that will depreciate the moment you opened the box. Got a used cheap drop weight for like 80 dollars and had no problems with it. If you're anything like me, any cost savings you might have realized by stringing your own equipment may be severely hampered by endless testing of new strings, and restringing a lot more frequently than you would have if you were paying someone to do it for you. If you're still going to buy a machine, increase your budget, save longer, and buy a better quality machine once. I wouldn’t knock someone for trying to do something new. Until you figure how much you like it and for that matter how to do it. I see nothing wrong with what the OP did. He’ll figure out through trial and error (like most of us do with anything in life) what works and what doesn’t. Kudos to you for having the patience to do it. For me personally, I know it’s not a skill I want to learn, so I’m more than ok with paying someone else to do it. I found it saved me a lot of money. I bought a used Neos 1000 machine and reels of string. I was paying 15 bucks for labor and 12-15 bucks for a pack of string retail. Now with a reel it's about 6 bucks a set of string and 20-25 mins of my time and that's it. The machine paid for itself quickly. I would guess I've strung probably 40-50 frames in the year and a half I've had the machine so that's over 500 in labor and the time I spend stringing is the same or less than driving to the store, dropping off the racquet, driving back, picking it up. I'm generally with you, opposed to the "get the best stringer you can afford" advice people tend to dole out. Their premise is that if you stick with stringing, you'll just end up upgrading to another stringer anyway, so might as well skip the intro machine. And they opine using a cheap dropweight might deter potential stringers from sticking with it, as it's more tedious to use. But I say, if you're not sure, better to start cheap. If you buy a $200 machine, the most you can lose is $200. Buy a $1500 machine and decide you don't like stringing...you get the point. Plus with some experience, you'll probably have better insight as to what you really prefer when/if it comes time to drop the big bucks. As far as deterring potential stringers, I feel like weaving crosses, tying knots, screwing up patterns, forgetting to clamp etc. are the biggest obstacles to newbies. If someone doesn't have the persistence to learn on say a Klippermate, I doubt they would be that much more resolute on a better machine. Though the best option is to go used. Then you can do both inexpensive and higher end. And if you decide stringing isn't for you or you want a different machine, you can get your full investment back when you sell the machine. Facebook Marketplace and Craigslist have some great deals if you're patient. Yeah that’s the second reason besides saving money. Having to plan ahead and drop off racquets and pick them up. I’m still on the fence about this but I might give it a shot. A bit far from me … but if anyone is in the Greenville/Spartanburg area of SC I'd be happy to get them started stringing. Dude the best deals I've seen on Facebook Marketplace recently have been in the Philly area. And same went for when I was looking before I got my machine. For me: initially cost more. Buying a machine, then buying a bunch of string and trying different combos. Once I settled down on that, I not only save money on stringing labor, but also save money on gas and time driving 40 minutes each way to have it done. Additionally, I also get more back doing some stringing on the side. Then the convenience of having a racquet done immediately if I need it. My 2 cents -- what @loosegroove said is the best advice. Start off cheap, you can always sell what you bought (for a loss) and then upgrade. A big factor to consider, is what your other options in your local area: how much it costs to get your racquet strung by someone, what is the lead time, how long it takes to get there, how good they are, and if they can offer strings which you like to try. For me, personally, the big thing turned out to be stringing natural gut and natural gut based hybrids using proportional stringing method. Our local tennis shops do not offer natural gut stringing at all, and I am sure they neither would accept, nor they are qualified to do proportional stringing. Nothing less than an electronic constant pull machine with fixed clamps is up to this task. With this scenario, whatever you would save on labor, you would use for strings and more frequent restringing. In the long run, you will spend way more than you would without the machine. If stringing with the cheapest string on the planet, synthetic gut, is your thing, than indeed you may save a bunch and can use any machine, as long as your time is worth nothing. Synthetic gut, if you buy it in reels, may cost you just about $2 or so per racquet, in materials. Look for a used DW with fixed clamps. There should be around. Some more affluent players try it out and don't want to mess with a drop weight and then sell it off in new condition. If you string every 2-3mos, I'd just go to a pro shop. It'll take you a long time to recover the cost of a machine. If you are a gear-head and just like to tinker and learn things, then go for it. But if it's to save money, you'll be in the red for a long time. I have a son that needs re-stringing every week. I need it every month. My daughter needs it 2-3x a year. I've paid for my DW fixed clamp already not only in cost but in time. It takes me 45min at the longest (stringing nat-gut). It takes me 45min to drive to the pro shop just to drop off my racquet. Unless you will string racquets with fan patterns my advice is buy a used Ektelon H or Neos 1000. As long as you don't spend over $500 you will not lose money on the purchase. They hold their resale value. Just don't get a rusty one. Agreed. It's kind of like crocheting for tennis players. Uhhhh yeah, duh, was there ever any doubt? Once I started stringing for a couple of friends, I've always had beer and tennis ball money in my bag. I bought a Klippermate in 1998, still using it today. I paid $150 shipped. I average 35-45 minutes per job and I don't try to rush. Best bang for the buck stringer out there. They have good string deals too. Best bang for the buck stringer out there. Agree. My first stringer was a Klippermate, €20! Still glad I good change to a ratchet-dropweight first, and then to an automatic dropweight (Stringway). Did not regret the upgrades, especially to a Stringway. Albeit manly crocheting, the kind John Wayne or Sly Stallone would do. So...I'd also like to start stringing to see if it's gonna be my thing to play with. 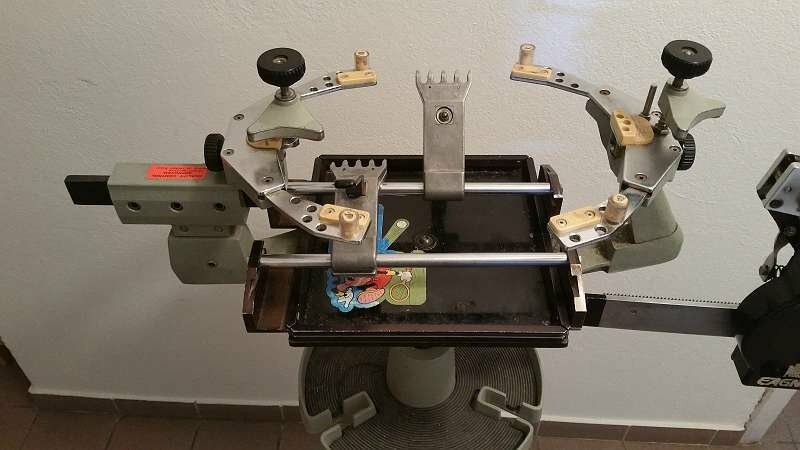 So I found and old machine for 50€ and I'm wondering if it's worth buying for learning on it. Rhe machine in question is on pictures below. As long as the crank works well, the clamps are in decent shape, and your racquets fit, that is a decent buy, even with it being an Eagnas. Yeah, if everything is working on it, not a bad find at all even if it is an older machine. You'll make your money back on that purchase in just a handful of stringings. Than I'm gonna give it a try. Seller states in the add that it's perfectly functional. Gonna go there with my stick to see if it fits in.